Hair Spa is the treatment that is supposedly capable of making your hair beautiful, lustrous and healthy. This treatment is meant to condition your scalp. Think of it as a relaxing experience for your tired, stressed and worn out hair, much like that for your body when going to a spa. It helps to manage from everyday pollution, dry wind, blow-drying, etc. Don't pay hundreds of rupees for products that may or may not work! These at-home treatments are easy to mix up right in your kitchen. The method begins with the treating of your head with oil in order to provide the necessary nourishment. You can choose any herbal oil for this process. Add few pieces of camphor to the oil and heat the oil. Do not boil. Make sure the captor is dissolved. To avoid the long waiting for camphor to dissolve, drop the pieces of camphor to the oil the previous night. 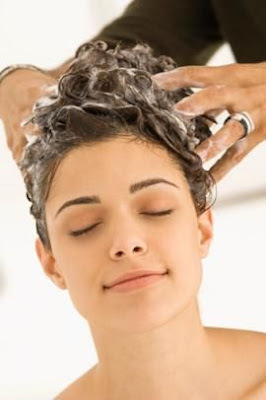 Following the relaxing massage, use a steamer for steaming your hair and scalp. If you don't own a steamer, use a towel soaked in warm water. I use the same steamer that is used for face steaming, but just that I will need somebody else to hold the steamer for my head. Steaming is an important part of this therapy since it is of great help to open the pores on the scalp. Leave the oil for about 3 hours. You should also cover the your head with a shower cap or a towel. Now, wash your hair with a good and mild shampoo and clean your scalp well. Add 4-5 spoons of lemon juice to the water that you use to rinse your hair. Lemon is a very good residue rinser. If you have a very oily scalp, Add spearmint leaves to water over medium heat. Bring to a boil. Add 4-5 spoons of this mixture to the water you use to rinse your hair after shampooing. Now apply your favorite conditioner and comb with a wide toothcomb while the conditioner is on. This helps in preventing breakage. Hair spa treatment seems so simple. This will help you save loads of money.This treatment helps to open up the pores and remove the excess oil that tends to clog. It also removes knots, dryness and helps for the healthy growth of the hair. Also restores the natural shine. amazing post..m going to try dis asap..btw which all oils can be used? hi i love hot oils.. how many times can u do in a week..